iPhone Central reports that Ten One Design has announced that their Pogo Stylus and Pogo Sketch input devices will work on the iPad. I would be happy to see this news if the iPad had any support for handwriting recognition in apps / the OS – but apparently it doesn’t, just as the iPhone doesn’t. 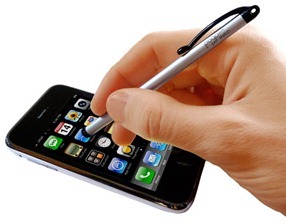 Without it, a stylus is only usable in a small handful of individual apps that offer some handwriting recognition – and from my experience most of these are quite clumsy and limited – and to use in pace of a finger when typing, which I have never found in the least bit tempting. Perhaps the only other good use for a stylus on an iPad would be if you are artistic and find it a good tool within drawing / painting apps. What do you all think? Can you see yourself using, or wanting to use, a stylus on the iPad? I’m an avid user of Brushes on the iPhone and find that the stylus from Pogo is very helpful. It’ll be interesting to see how the extra surface area of the iPad changes the painting experience, and if the stylus will be a benefit or not on the iPad. I’m looking forward to seeing how it works out…. Brushes always strikes me as an amazing app, even though I am a complete non-artist myself. I'm looking forward to seeing lots of wonderful iPad art. I have poor eye/hand coordination and have used a Pogo stylus since I first bought a 3G and 3GS. I use it for data input, drawing and so much more. I wouldn't consider any type of tablet w/o some type of stylus input. Thanks for the comment. I'm glad to hear the Pogo stylus is useful to you. I want it to be for me, and feel it has potential to be, but the OS is holding it back for now.